Women’s health has always been an indicator of social welfare. However, in present times maintain health is not an easy thing. Work, psychological strain, stress, pollution, and a lot of personal problems, such as low self-esteem, alienation and others, directly or indirectly, affects the reproductive system. Stressful situations can trigger women gynecological diseases and endometrioid ovarian cyst is one of them. The disease is a sign of hormonal imbalance. 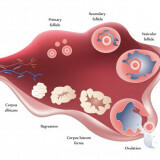 Mainly women from 20 to 45 years old (reproductive age) have the cyst. 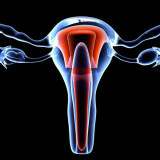 Endometrioid ovarian cyst has different causes. It can be stress that leads to endocrine system disruptions and other factors. 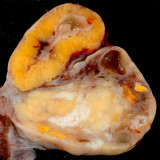 This endometrioid ovarian cyst is a serious disease. It is a good-quality tumor in the form of a bag, filled with a thick fluid (secretion). The late stages of the disease may have such complications as suppuration; the walls rupture, when the content gets into the abdomen. This can lead to peritonitis. Sometimes the cyst is growing big (more than 12 cm). Furthermore, this causes the formation of adhesions in the ovaries, which affects the ability to conceive. 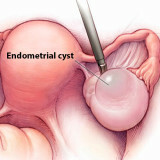 Endometriod ovarian cyst symptoms in most cases are not expressed. At an early stage it can be diagnosed only by gynecologist and ultrasound apparatus. You better not postpone the visit to the doctor when there are nausea and vomiting during menstruation, dizziness, painful bleeding and spotting between cycles. Painful periods can also be a symptom of uterine fibroids and polycystic ovary. At the early stage such formations can be treated with medication. However, late staged forms are treated with surgery. With early diagnosis almost all diseases are curable, and endometrioid ovarian cyst is not an exception. Treatment in this case is carried out in a conservative manner. In this case, non-steroidal anti-inflammatory drugs are appointed along with hormonal and pain relievers. Also, the immune system strengthening is required. It is recommend to take vitamins, immunomodulators and products containing enzymes. Operations are necessary for large ones (over 5 cm) when medical treatment is ineffective. It is performed with using of laparoscopy – most gentle method. This can save and restore the ovarian tissue. 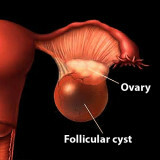 In the postoperative period the hormonal treatment is prescribed to prevent endometrioid ovarian cysts relapse. It is important for every woman to monitor their health. Proper diagnosis of a disease can save lives and allows to realize the dream of many people – to become a parent. Although even such a disease as endometrioid ovarian cyst, can now be safely healed, health should be treated carefully so, that happiness of life was not overshadowed by anything. Next story Cervical cyst. What is it? How to treat? 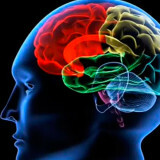 Previous story Arachnoid cysts in the brain and its clinical picture.